Blue Ridge Women in Agriculture and a coalition of faith-based and community groups hosted the High Country's FIRST Food & Faith Gathering on May 19, 2018 at the Boone United Methodist Church. It featured panel speakers, facilitated discussion, and breakout sessions. The Food and Faith Gathering aims to strengthen the network of faith communities growing, redistributing, and sharing food as a part of their faith witness, as well as introduce people who are new to this work to ways they can become involved. Folks who are already doing Food & Faith work to connect and see where the needs are within our community. We believe that there are things happening here, but we need to figure out what are the next steps. We need to create synergy and build a stronger network. Folks who are new to or interested in Food & Faith work to learn more about how they can become involved. This means engaging fellow community members, offering introductions, and providing connection points. The Piedmont Women in Agriculture's goal is to gather women in farming together for learning about: personal, economic and environmental sustainability; creating connections through the food system and developing networks for collaboration and peer-to-peer education. Community gardening, and Improving food access. 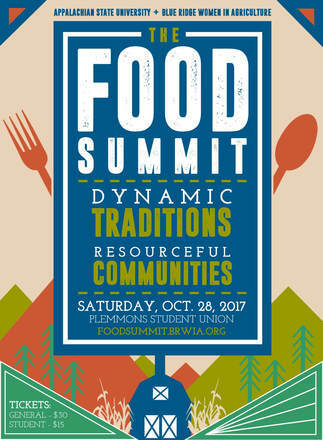 Other Food Summit activities encourage attendees to explore what makes High Country communities both unique and uniquely regenerative: self-healing, self-sustaining, innovative, and resourceful. A locally-sourced lunch is also served.